Happening upon a site with an extensive “Frequently Asked Questions” page, I often wonder: How many of these questions are actually asked by real people communicating with this organization – and how frequently? If we acknowledge, as we should, that effective content must address both user needs and business goals, FAQ pages start to become problematic. 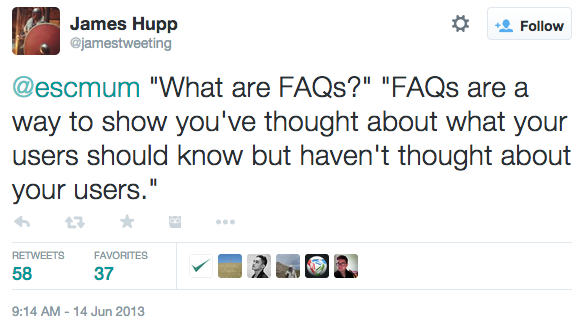 At best, FAQs represent an anemic attempt at responding to questions users really do frequently ask. But while it might fulfill our “user needs + business goals” criterion, isn’t the FAQ page’s very existence also a clear indication that user needs aren’t being met by an organization’s more prominent content? At worst, FAQs address the concerns of a particular business unit without actually taking into account what users want to know. When this is the case, FAQs aren’t just superfluous; they’re disingenuous, too. I’m not saying FAQ pages are anathema. In situations where data indicates FAQs are the best way to assuage legitimate user concerns while also addressing some business goal – pushing audience members through a buying process, for example – I say go for it. A thoughtful, intelligently created help desk or help center might fit into this category. Most of the time, though, the best approach for the FAQ page is to strive not to need one.